Silicon Power presents its newest product of a USB 3.0 flash disk named Marvel M60. Flash disk is claimed to have the ability to read at speeds up to100 MB/sec, while the write speed of up to 70 MB/sec. Marvel M60 design quite simple, but elegant. With a layer of electro-plated metallic casing without cover, flash disk has a USB connector that can be issued insert (retractable). In the display, flash disk has a dimension of 73mm x 22mm x 9mm and weighs only 15 grams. The LED indicator light will illuminate when Marvel M60 connected to the USB port. The same lights are also lights up when the transfer takes place. USB 3.0 flash drive is offered in a choice of 32GB and 64GB capacities with a lifetime product warranty. 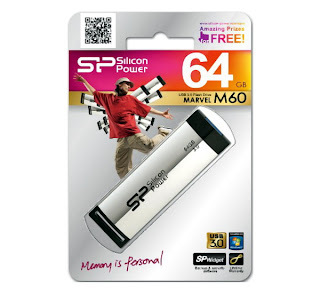 Marvel M60 owners also offered the opportunity to download the application SP Widget that provides seven tools backup and security, as well as Norton Antivirus 2011 free 60 days. Marvel M60 can also be operated on a USB 2.0 port. However, its performance will inevitably decline. Silicon Power said, the USB 2.0 flash disk read speed is only 30 MB/sec, while the write speed of 20 MB/sec. Storage device made ​​by Silicon Power supports XP/Vista/7 Windows operating system, Mac OS 10.3.x, Linux Operating System 2.6.x. This device is also claimed to have the staying power of up to 10,000 times the insertion / removal cycles of the data and have the ability to operate at a temperature of 0 ° Celsius to 70 ° Celsius.